There is not much this little dog can not do, from showing to obedience and agility to racing on a track or competing in a lure coursing event. The whippet is renowned for having a wonderful gentle temperament which makes them a terrific family dog! It is generally agreed that the Whippet as we know it today developed in Northern England during the mid to late 19th century. Greyhounds were crossed with small terriers, (including possibly the Bedlington Terrier), to produce a small, swift hound capable of hunting rabbits and other small game. During this era, the whippet belonged mainly to the working class people of England. These were factory and mine workers in Northern towns near Manchester and Liverpool, who worked hard and lived simple lives. Because of this, the whippet became known as the "poor man's greyhound" or the "poor man's race horse". During non-working days, owners raced their whippets in fields and on town roads. These races became known as "rag races", probably because a piece of cloth was used as a lure. The dogs typically ran a straight 200 yard track. The Whippet was first recognized as a registerable breed in England in 1891, when it was recognized by the Kennel Club of England. Today, Whippets are the most popular of the hound breeds at dog shows. Their size, short coat, and agreeable temperament make them the perfect family pet. Organized activities for Whippets and their families can be found in most areas, and include lure coursing, straight racing, flyball, agility matches, and of course, obedience training. Whippets are independent thinkers, and many of them find obedience training to be somewhat beneath them. But those who do enjoy it have excelled, and there are quite a few Whippets who have earned obedience championships. 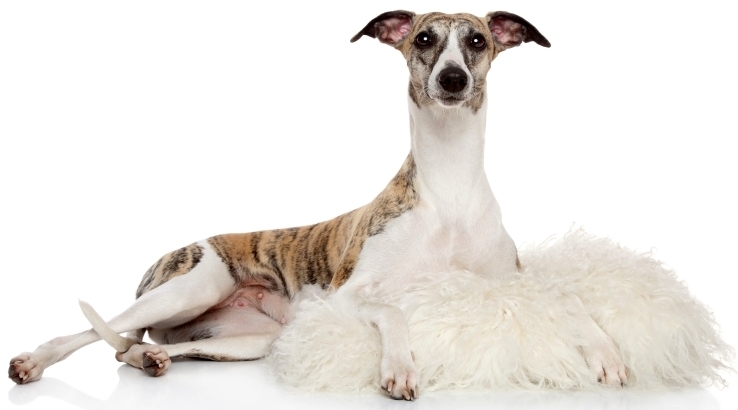 Whippets are gentle and lovable pets to live with. The Whippet is a hound and therefore will chase more or less anything that moves - so an enclosed garden is essential. He likes nothing better than a run over the fields, but will return when called. He is happy in close association with his human family and will take a full part in the family fun. But he was bred to race, hunt and course, and so he must have his good run every day - and then, being rather sophisticated for a dog, he will be happy to curl up quietly in a corner of your best sofa. The Whippet has a fine single coat, which means, when walking, that he needs extra protection from the elements in the colder months. Grooming is simple - just a good rub over with a damp cloth, and if he comes in muddy, a damper cloth, followed by a dry one. The nails have to be trimmed about every two weeks and, basically, that is all. Whippet owners don't know how lucky they are with such an easily managed little dog, which is free of inherited conditions.